We all rose early and left the house at 5 a.m. My family dropped me off at the airport, and I left the desert to fly to Seattle. I've flown into Portland several times, and it was my destination today, but AlaskaAir's flight schedule did not have a direct flight to Portland today. The flight was lovely, with lots of snowy mountains below. And flying into Seattle is far more beautiful than flying into Portland--views of the Olympics, the ferryboats on Puget Sound, Mt. Rainier, and the Cascade Mountains. My seat was next to the window. On my right was a young Asian man, focused on his laptop and his Ipod. Next to him was a young blonde guy, also focused on his laptop and Ipod. As I also used these two items during the flight, I felt part of the young hip technological crowd. The two young guys fell asleep on their laptops and I envied their ability to sleep on an airplane. When we landed in Seattle, the blonde guy called someone on his cell phone; someone who was going to be meeting him at the airport. He kept saying, "Just look for the guy in a camo jacket wearing combat boots and carrying a violin." This was such an odd combination, but I was puzzled when he ended the conversation with "See you in a few minutes, Mom." Why wasn't his mom going to recognize him? In the row behind me sat a woman carrying a dog. It was securely zipped into a soft carrier, but I heard it occasionally. Next to the dog-carrying woman was a very young woman, eighteen at the oldest, who had been wearing quite a lot of mascara but most of it was now on her skin because she had been crying. Apparently she was flying standby and almost didn't get to board the plane. I heard her repeat over and over, "I just want to get home to see my baby; he's 2 months old. They almost didn't let me on the plane. I just want to see my baby." Of course I don't know the rest of the story, but it was heartbreaking to listen to her. She seemed to strike up a conversation with the dog lady who helped calm her down a little. I've been praying for her today, and for her baby son. My best friend's mother in law picked me up at the Seattle airport and we met my best friend in Tacoma. We carpooled with several other ladies to Portland for a women's retreat hosted by my best friend's church. A retreat seemed the best way to fuel up for what promises to be a rather draining week. We're staying at a Marriott Residence Inn. I attended the first session of the women's retreat tonight. My mind drifted in and out, worrying about interacting with my dad this week, and hearing some of the speaker's words. The theme this week is Identity. It is refreshing to be with my best friend....we've walked together through so many life experiences, living several states apart most of the last twenty years, but retaining our close friendship. Protect me, God, for I take refuge in You. to the evidence of Your love for me. Today I had the "you need to stay in your assisted living apartment" conversation with my dad. I thought he had already decided to stay there...in fact he told me he had a couple weeks ago...but now he doesn't remember that, and he is not happy. Thankfully, he did not get angry with me, he was calm, but so depressed by the idea. I do not handle these serious conversations well, but I knew I had to get it said over the phone before I was actually there. I am still shaking. It's hard to use the mouse when you're shaking. I used to be able to diffuse angry customers when I was a working woman, but I have become a wimp. I was smart today though...I made the call from the bathtub. Really helped me stay calm. Although the shaking could have caused the demise of my phone, thankfully I did not drop it. I've been putting off the Big Shopping Trip to Super Walmart, but today I could postpone it no longer. These trips always exhaust me, especially when I take the three princesses with me! Today I wore my pedometer. I reset it when I left the van, and by the time we left Walmart, I'd walked 2.07 miles! No wonder I feel tired! After bringing in all the groceries, walking back and forth from the kitchen to the driveway, I reached 2.45 miles. I also have a sore back and a broken fingernail (not to mention the depleted bank account). Then I have to rearrange the pantry so that all those groceries will fit in there. I bought far more processed/prepared items than usual, to make things easy for my children's caregivers when I'm gone next week. When I was little my dad used to make my bedtime snacks. My favorite was a "butter" and sugar sandwich. White bread, margarine, white sugar. Simple. Not healthy. Yummy. This week, I've rediscovered this pleasure, but I've upgraded to whole grain tortillas and raw sugar and real butter instead of the spread we used to call "butter". the matter into Your hands. to You; You are a helper of the fatherless.. I praise You and thank You for Your goodness and guidance. Counselor, Prince of Peace, Mighty God, Everlasting Father! and You hold the entire situation in Your hands! Help me remember Your words. I will sing about the name of the Lord, the Most High. what is man that You remember him...? O Lord, my refuge, my hope, my Creator! and I choose to keep praising and trusting. Are you a Blogging Homeschool Parent? and here is a webring of blogs belonging to members of The Homeschool Library forum (I'm a member). Listen to my words, Lord; consider my sighing. Pay attention to the sound of my cry, my King and my God, for I pray to You. ...Let all who take refuge in You rejoice; let them shout for joy forever. Your abundant love calls to me, and I bring my burdens and requests to You. I know You hear my sighs, my grumbles, my anxious thoughts. I missed a daybreak meeting with You today, but You met me at 10 and again at 5. And Your presence carried me through the day. and I can expect You to continue to carry me. You are my refuge, my joy, my shelter. I will proclaim Your goodness! I don't have anything to offer for this week's Weekend Herb Blogging, but it is hosted at Swirling Notions. Oh, Lord, when life seems low on delight, remind me to seek Your Word. How I need that shield, and that lifting up, today, Lord! Only You gave me relief from anxiousness last night, Lord, giving me a peaceful, though interrupted, rest. In the last 12 days, I have left the house once. To buy cat food. Illness at our house has kept me in. Tonight I have a big outing planned.....to the library. And tomorrow I am GOING GROCERY SHOPPING. By myself. Exciting stuff. Near our grocery store is a little French bakery that makes the loveliest lattes, and their pastries are heavenly. I will take a book, and spend a little time there before tackling the grocery list. We ordered an air filter from Oreck. With all the construction happening near us, we thought it would help with allergy issues, but we mainly wanted the free vacuum cleaner they promised in the commercial. We've had the filter for almost a month now -- and the children and I have been sniffly the entire time. The filter makes loud snapping noises and blue sparks every time I open the front door; the children are quite frightened by this. The commercials for these air filters make it sound as if the free vacuum arrives with the filter, but actually the filter comes first. Almost a month later, I'm still waiting for the voucher to arrive -- then I have to put a sticker on it, and return it, and then they send the vacuum. I've given up. My husband bought a Bissell (see this post) and I'm going to return the Oreck air filter. My feeling of being blessed within the stress lasted about three minutes. Long enough to click "publish this post". And then anxiety set in. A practically sleepless night followed, and by last night I was just a quivering blob of panic. Too many burdens and I'm not handing them over to Jesus like I should. And my Bible sits near my bed, unopened, because I feel incapable of focusing on anything deep. This is rather silly, as a Psalm would probably be just what I need. Yet within the stress and the anxiety and the exhaustion, a still small voice penetrates the fog, whispering words I committed to memory long ago. My dad moved into an assisted living center last week, and all seemed well, until we ran into a bit of a glitch with the financial aspect of this, and I need to get him on medicaid. Now. I have his power of attorney, but I don't have any of his financial information. He has a church friend helping him keep his bills in order, so I think I can get his financial stuff, it will just take a few phone calls and e-mails, and some time. And then there is the disposal of assets....and a million details...and I am overwhelmed. But I keep remembering Extreme Makeover Home Edition last night. The team was building a house for a family whose 19 year old son was blind and confined to a wheelchair. He had such a positive outlook on life! And then there was a shooting not too far away from us, that took the life of a boy my husband once taught. I've felt a bit whiney lately -- with the never-ending cold, and sick kids, and back pain, and stress about my dad...but I have to remind myself that I can see and I can walk, and I have three beautiful children and the sweetest husband in the world. I am blessed. We all know we should eat more raw veggies, and greens are supposed to be especially healthy. Here's an easy way to add more to your diet! A green smoothie is simply a smoothie with greens in it, which sounds a bit strange, but is actually quite nice. Start with a mint smoothie to ease into the idea. Liquefy in blender. Serves 2. This is such a convenient way to add more greens to your diet. I find that a smoothie and a small serving of granola makes a great breakfast. When I began drinking these regularly, my migraines disappeared! Of course the variations are endless: romaine or shredded cabbage instead of celery, melon instead of apple.....and if I run out of frozen berries, I just toss in a spoonful of fruit spread for a little extra flavor. For a zippy taste, add a little raw ginger! A shake of cinnamon or cardamom can really add variety too. A lunchtime smoothie could include cilantro and oregano instead of mint. I just finished reading A Legacy of Love: Things I Learned from My Mother, by Ruth Graham. It is, of course, written about her mother, Ruth Bell Graham, wife to Billy Graham. It is a small book, filled with insights about this admirable woman. I was particularly challenged by Mrs. Graham's thoughts on journalling. She advised her daughter to record the shining hours of her life. I thought about my own haphazard journalling and blogging, and I realized that too often I just use it as a chance to vent. Now venting is certainly valuable -- I can't keep everything bottled up inside -- but a journal preserves the events of my life, and do I really want my life to sound like one big whine? The author also talked about finding shining hours within the dark times of life, because those dark hours make you reach out for the Light of the World. I've always admired Ruth Bell Graham, and this book gave me a more complete picture of her. Her daughter said that Ruth was always reading several books at once, because, in her words, "One does not finish all of the pickles before opening the olives." No one told me that after I turned thirty I'd get pimples again! And the last few months, the blemishes have been more frequent than ever. I tried several different skin care systems, and nothing seemed to work. Finally I talked with a friend who sells Mary Kay, and she came over and let me try a few things. I decided on the Velocity products (the cheapest! ), and a week later I am very pleased. No new pimples, much smoother skin, and the previous pimples have flattened and almost vanished. I bought the acne treatment gel too. Velocity is mainly marketed to teenagers, but my friend said lots of mature women use it too. It has a light pleasant citrus fragrance. I'm tired of referring to my children as "the three year old", "the two year old,", and "the six year old", so I guess it's time to introduce them to my blogging audience. Faith is 6 and in first grade. We are homeschooling. Faith is convinced that she is a princess and demands her regal rights often. She loves to draw and sing. Faith has green eyes and long wavy hair. Rose is 3 1/2, and she's my storyteller, often telling me tales of princesses and bad kings. Rose has big blue eyes and short curly hair. Joy is 2, has a bright smile and she's always ready to give hugs and cuddles. She loves her baby dolls. I read this last fall, and found it thought-provoking, comforting, and challenging. (Perhaps I use those words to describe all my favorite non-fiction books.) The book challenges its readers to follow Jesus -- to study Him and follow His example -- instead of just following fellow Christians or trying to fit in at church. I was especially impressed by the author's discussion of Jesus' changing the water into wine. I had never noticed that Jesus used the water pitchers that were set aside for ritual cleansing! As if He were asking us to put aside our rules and lists of dos and don'ts, and just enjoy life with Jesus. I highly recommend this book to anyone who has been hurt by the church or fellow Christians, to those who feel their spiritual life could use a little more passion, and to those who just want to know Jesus better. My stressful Friday swept all ideas of funny posts away. But as always, the children insert bright spots into tough days. My three year old is my dreamer, my story-teller, my future poet. We had dinner with some friends on Friday night, and during dinner, she suddenly went into a little dreamworld with her own music. She stopped eating, and hummed Beethoven's Ode to Joy for a while (thank you, Little Einstein creators, for making my child sound so cultured) before returning to her dinner. The kids have been watching the Veggie Tales version of Daniel, where they've heard of a city named "Babylon." Today they were all eating bologna, but my three year old kept calling it "babyloney". I was awakened at 4:30 this morning by a pounding headache. At 6 I gave up on the idea of sleep, and had a bath with aromatherapy (a blend of tea tree oil and euclyptus oil). Neither esberitox nor echinachea tea diminished the pounding. My husband was gone all morning, but the children didn't run too far amok while I laid on my bed with my lavender eye pillow. My sweet two year old would climb up on the bed every half hour or so for a little cuddle. This afternoon I tried the strong-coffee-followed-by-dark-beer headache cure but it didn't help either. The worst thing was being unable to read or go online without increased pain. Life without books or the internet is dreary. The kids and my husband were gone this evening. I suddenly remembered a homeopathic remedy I'd purchased several months ago, and it helped! Why oh why didn't I think of that at 4:30 this morning??? 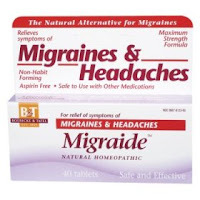 The remedy was Migraide, available at Whole Foods, Amazon, and probably many health food stores. (I'm not sure why I can't post a photo at the end of a post....blogger seems to put them all at the beginning). I'd like to introduce you to my favorite herb plant: Sweet Cicely. The dainty fernlike leaves have a gentle licorice fragrance. I've never eaten even one leaf, but I love it for garnishing sliced fresh peaches. It leaves a tiny bit of fragrance on the peaches, but its fresh and fragile beauty is its finest feature. Those fernlike leaves remind me of childhood wanderings through the cool green woods at my Grandma's house. My first sweet cicely plant was a gift from a friend when I began growing herbs. It was the summer before I got married, and I was planting herbs in containers, preparing for marriage to a gourmet cook. I knew that we would not be financially prosperous newlyweds, and I thought a few herbs would spice up our cheap food. I had the basics (rosemary, chives, thyme) and sweet cicely seemed an exotic addition to my collection. It grew slowly, but several years into our marriage, the plant was large enough to use for garnishing. When we moved to the desert, I took a small sweet cicely plant in a pot. One leaf held on bravely for awhile, but the tiny plant did not survive the year. In the five years since then, I've ordered plants from Nichols nursery and ebay, but I haven't had much luck. A year ago I was surprised to find a few tiny leaves appearing where I thought I had completely lost the plants. But within the month they too were gone. I've given up. I'll try again someday when we move to a cooler climate. I miss my favorite herb; perhaps I'll find a botanical print I can hang on the wall while I await a more herb-friendly environment. This week, Weekend Herb Blogging is hosted by http://ostwestwind.twoday.net/. Rules for Weekend Herb Blogging are here. My dad saw his doctor today. I had set up the appointment for him because he was unable to communicate with a dentist last week, and I suddenly realized that we have a problem NOW (I knew it was coming, I just didn't realize how far advanced it was). The doctor recommended a nursing home for a month to get his meds straightened out (because he has been self-medicating, probably taking too much of some and not enough of others). The doctor's thought is that after a month in a nursing home, if Dad's mental state has improved from the supervision of his meds, we could look for an assisted living situation. My dad said he would not do this. The doctor said that if my dad won't agree, my next step would be to hire a family attorney and have a mental competency evaluation ordered for my dad. Hiring an attorney sounded very expensive -- I wondered if it might be worth a try to have my dad talk with a few men he respects??? I e-mailed a few people, updating them on my dad's appointment and asking for prayer. I was sitting here worrying about what to do next when my phone rang. It was my dad's cell phone. Anxious thoughts jumped into my mind; why was he calling from his cell phone? Was he running away from home? (This is not as far-fetched as it sounds. He checked himself out of his post-surgery nursing home against his doctor's wishes.) I picked up the phone reluctantly. My dad wanted to know if I was comfortable with him going to a nursing home for a month. !!!! He ate lunch with my husband's aunt, and her wise words made an impression on him. Now, I don't know if he knows that after a month he may not be coming home, but moving to an assisted living situation.....but one thing at a time. I'm not buying books during Lent. It's the first day of Lent, and I've already been tested. I'm a member at paperbackswap.com, and I have some books listed there, but I didn't have any credits today. I got an e-mail this afternoon, saying that they were holding a book for me: A Legacy of Love, written about Ruth Bell Graham by one of her daughters. I really really wanted that book .... but I had no credits and I didn't want to spend money on books this Lent season. I reluctantly clicked on "No, I don't want this book", so that I could move on to a different part of their website. I ran to the pile of books I've been meaning to list on paperbackswap, and added five to my account. Within two hours, one of those books was requested! I got instant credit by printing the label with postage on it...but in the meantime, another book from my wishlist had appeared (Twelve Ordinary Men, by John MacArthur). I spent my instant credit on that, and I listed five more books. It was only half an hour before one was requested, and amazingly, no one had ordered the Ruth Bell Graham book! So...I ordered two new books today, but I stuck to my resolution. When Cathy brought her housekeeper to help me, she used Soft Scrub with Bleach to clean the kitchen counters and the sink. I was impressed with this product and I bought some Soft Scrub without Bleach (because bleach scares me: fumes! spots on clothing!). I used it in the kitchen, and it works fine without the bleach. Today I tried it on the dining room table. I often forget to wipe the table after dinner, and by morning there is FOOD stuck all around the edges. I've scrubbed and scrubbed (not as frequently as I should) and I have not been successful in removing the gumminess left by small fingers and frequent spills. But today I finally accomplished it, with the help of Soft Scrub. I don't know that it's safe for fine furniture, but it works on our old table! I thought this was going to be my favorite product of the week: Batter Blaster. It looks like one of those cans filled with whipped cream, but instead it's pancake batter. Just point it at your griddle or skillet and spray. It sounded great. My husband used it with an electric skillet and he said it worked really well. But it didn't work for me. I started out with the griddle on medium heat, and the pancakes burned. I kept lowering the temperature but they still burned. The bottom would be dark before they were firm enough to flip, which made a mess. Nice concept. Not so great in actual practice. If my husband gives me any tips on improving my technique, I'll pass them on! Serves 2 as a main dish entree. Accompany with a green salad for an easy dinner. Preheat oven to 375. Spray two small oven safe dishes (ramekins) with PAM. Microwave the spinach, wrapped in a paper towel, for about one minute (til it's wilted). Divide spinach leaves and basil leaves between dishes. Sprinkle with half of the romano cheese, dividing the half between the dishes. If desired, place a couple dabs of hummus in each dish, and some diced tomatoes. Add a couple slices of goat cheese to each dish, if desired. Crack two eggs into each dish. Don't stir them up or try to blend the ingredients. Pour 2 tbsp cream into each dish. Sprinkle with salt and pepper and remaining romano. Bake for 25 minutes or until eggs are set. Woo-hoo! I'm going to see my best friend at a women's retreat a thousand miles away. Ack! While I'm on this trip I'm going to visit my dad. Will I have to make decisions about a move for him while I'm there? It's very likely. But I'm going to a women's retreat for the first time in 6 years! Woo-hoo! Ack! I'm not ready to make decisions about my dad's future. Woo-hoo! I get to share a room with my best friend! Just like being a teenager again! Ack! Everyone will see how fat I am! Woo-hoo! I'll get to feel the fresh breezes of home! Ack! Who's going to take care of my kids while my husband is working and I'm out of town? As a stay at home mom who really does stay at home most days, I do try to broaden my horizons through reading. This book definitely did that for me! Flirting with Monasticism, by Karen E. Sloan, is the story of a young woman (a presbyterian minister) who is attracted to a man who is in the process of becoming a Dominican friar. I found the author's way of telling events in not-completely-chronological order to be a little distracting, but the book was a simple overview of the monastic life. It was very interesting to see that although the woman's attraction to the man did not lead to a romantic relationship, it did lead her to new spiritual habits that enriched her life. This book made me wish I could visit a church where Dominican friars chant the office. It made me seek out other books on the same topic (Next on my list: The Cloister Walk, Monk Habits for Everyday People). It made me long to schedule regular routines of worship and service in my daily life (or perhaps to become more aware of these routines already in my life). In summary, it is a good introductory book for Protestants who want to learn about the monastic life. Dawn the famous blogging mom answers questions from her readers on Sundays (http://www.mom2my6pack.blogspot.com/). I think her example is worth following. Q. How do you keep your sanity as a stay at home mom (and a homeschool mom) with three kids 6 and under? 6. (last but definitely not least) getting up earlier than my household to pray and read the Bible. And I confess, the question did not come from my vast audience, but I have been asked this question several times. Why were there cheerios in my daughter's closet? Why did my eyebrow comb (which has been missing for 2 weeks) suddenly show up in exactly the part of my makeup drawer it's supposed to live in? Why do so many Americans watch reality television? Don't they have enough reality in their daily lives? The helpful cashiers at the health food store are always stuffing helpful brochures in the bag with my purchases. Last time it was a brochure about losing weight; I grumbled a bit about what they might be hinting at. But several times they've given me brochures about the herb oregano, once even offering the information that it is helpful in getting rid of sinus infections. I've been sniffly for several weeks now, and my usual treatments (grapefruit seed extract, oregon grape root, esberitox) weren't working as well as I expected. Probably because as soon as I start improving, I forget to take them. I decided I either had a sinus infection or was very close to one, so I thought I'd give oregano a try. Wow! On Friday I was seeking a kleenex every ten minutes, on Saturday the sniffles disappeared after the first five minutes I was awake. I should mention though, that if one happens to burp five minutes after swallowing an oregano capsule, the sensation is a bit weird. The kids are enjoying one of their favorite programs tonight: The Lawrence Welk Show. My oldest has loved the show since she was two years old; her favorite person is the tap-dancer. Tonight she asked if Lawrence Welk "used to be real". Meanwhile, my middle child was fascinated by the "beautiful ladies" with bouffant hair. In other "wunnerful" news, my back pain is almost gone! Not just weak and weary--but also wimpy. I talked with my dad today and I didn't tell him that I talked to his doctor's nurse yesterday, and that they want him to come in for an evaluation of his meds. I can't make the appointment until Monday....so why rush mentioning it to him? I don't know how he will react; he may be annoyed that I got involved. I've spent my entire life trying not to do things that might make my dad mad (or at least making sure he didn't find out about anything that might make him mad); it's difficult to abruptly change. I was hoping to win the grooviest pair of Keds today on ebay, but I was outbid. At lunchtime today I got a call from a dentist two states away. My father went to the dentist and couldn't fill out the forms, and couldn't interact logically with the person who was trying to help him with the forms. This incident with the forms is disturbing -- he's a retired accountant! Filling out forms is his specialty! Is this a drug interaction, or is this dementia? How am I going to convince him that he needs to make a change in his living situation? He's been annoyed by any advice I've given lately. How does one go about making one's parent's decisions for him? Do I need to fly home? That would mean more childcare to arrange, which is difficult as one of my friends is quite pregnant, one is taking chemo for breast cancer, one just got a job, and one just moved away. All these thoughts are quite wearisome. Thank God, a new book arrived today. (And I do not say that flippantly, I say it as a prayer of gratitude.) Yet another Adrian Plass -- this one's called The Sacred Diary of Adrian Plass On Tour (don't buy it at Amazon, do a search for the isbn at addall.com to find a cheaper price). This is the third in the Diary series. These are fictionalized accounts of Adrian Plass's life, and they are roll-on-the-floor hilarious as well as thought-provoking and serious. Woven into the fictional Adrian's thoughts and experiences are spiritual insights that I mull over long after reading the book. Reading Adrian Plass at naptime or bedtime makes the bed jiggle with my laughter, but I drift off to sleep in peaceful contemplation or a prayer of renewed commitment. Last night we watched Mr. Bean's Holiday. What an enjoyable way to spend an evening! I like the Mr. Bean episodes on dvd, but I didn't really care for the last Mr. Bean movie I watched (Bean: The Movie, where Mr. Bean came to America. It had a bit of an American movie flavor instead of that charming British humor that I appreciate). Mr. Bean's Holiday is set in France, and as is typical for Bean, there is little dialogue, just lots of physical humor. I highly recommend it for all ages.